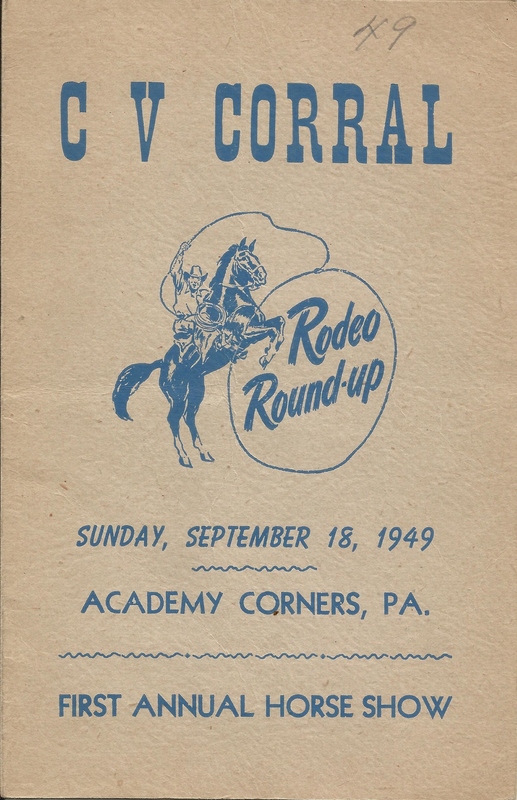 Originally known as the Cowanesque Corral and later changed to the CV Corral the club was organized in early 1947 by a group of interested local horsemen including Bob Miller, Ralph Seeley, Russell Hurlburt, Hugh Doan, Dr. M.O. Holmes and Leo Gee. D.L. Stoddard was the Announcer for the first annual horse show held in Academy Corners. Arena Directors were Walter Merritt, Hugh Doan and M.O. Holmes. Judges were Guy Jamison, Robert Hafer and R. LaRue Davis. The Elkland High School Band supplied the music. Classes included Open Western, Musical Stalls, Men’s and Women’s Relay, Children’s Running Race, Balloon Race, Musical Chairs, Pony Express, Rescue Race, Barrel Race and Western Running Race. Entry fees ranged from $3 to no fee for the Children’s Running Race. A trophy was presented to the high point winner of the rodeo. Early shows were held at various locations in and around Knoxville, Pa. For their Mother’s Day Show in May of 1951 the show was held behind Schoonover’s Dairy. Subsequent shows were held at the H.C. Schoonover Farm, in the rear of the Knoxville Livestock Sales Barn and at the Jack Vogel Jemison Valley Farm. In July of 1954, the CV Corral hosted a dressage exhibition with Bill Pinney & Black Diamond “The Wonder Horse”. In May of 1956 Mr. and Mrs. Lawrence Krise organized a 4-H light horse and pony club called the C.V. Lucky 4-H Club which was one of the first to be formed in Pennsylvania and was under the sponsorship of the club. In June of the same year, the club incorporated as the CV Saddle Club and in 1957, purchased 7 acres of ground from William and Beverly Mills. Originally part of the L.J. Swimley estate on Rte. 249 in Phillip’s Station, it was to be used as a permanent show ring and meeting place. Total price of the land was $500. By this time the club had grown to more than 30 families with over 75 riders from the Elkland, Knoxville and Westfield areas. Anyone who was interested in horses, whether or not they owned one was invited to join. Yearly dues for a family was $3. In the early years the Knoxville Fire Dept. benefited from the horse shows with refreshments being sold by the Ladies Auxillary of the Knoxville Volunteer Fire Dept. Later, Crary Hose of Westfield took over the food booth. From November of 1976 until October of 1979, the club was inactive. Fortunately, a group of enthusiastic equestrians saw a need for something positive to occupy our area youth and re-activated the club. Through the combined efforts of Rose Hager, D. J. Hall, Pat McGee, Jeryl Abbott and Patty and Bryan Cady horse shows became a popular activity in the valley once again, averaging 100 or more participants at each event. In August of 1994 activities at the grounds were put on hold after the access road washed out due to flooding. With help from the community the road was eventually restored and activities resumed at the grounds. Eventually the saddle club evolved into the Keystone Rangerbred Association, holding shows the 2nd Sunday of every month, rain or shine starting in May. In 2007 the club paid out over $2,387 in prizes and awards with over 60 riders competing. In 2013 the club incorporated under the name Cowanesque Riding Club and attained 501(c)3 status in late 2014.